Botanical Name: 1. Rhaponticum uniflorum (L.) DC. ; 2. Echinops latifolius Tausch. Source of Earliest Records: Shennong Bencao Jing. Part Used & Method for Pharmaceutical Preparations: The roots are dug in autumn. After the fibrous roots have been removed, the roots are cleaned, dried in the sun and cut into slices. 1. Boils, carbuncles and swelling or swelling and pain in the breast area. 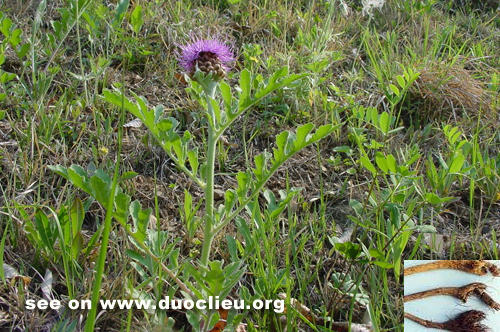 Globethistle (Loulu) is used with Dandelion herb (Pugongying), Trichosanthes fruit (Gualou) and Forsythia fruit (Lianqiao). 2. Postpartum galactostasis with distension in the breasts. Globethistle (Loulu) is used with Vaccaria seed (Wangbuliuxing), Pangolin scales (Chuanshanjia) and Rice-paper pith (Tongcao).